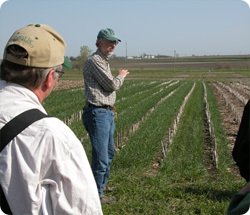 The Iowa Cover Crops Working Group is part of the Midwest Cover Crops Council, which is a working group affiliated with Green Lands, Blue Waters. The mission of the MCCC is to significantly increase the amount of continuous living cover on the Upper Midwestern agricultural landscape. Iowa team leaders are Sarah Carlson (Practical Farmers of Iowa) and Tom Kaspar (USDA-ARS). 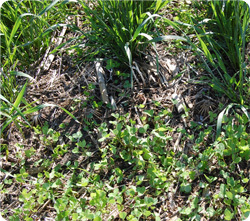 Cover Crops for Sustainable Crop Rotations Sustainable Agriculture Research and Education Program (SARE) primer about cover crop selection, management, economics, establishment, soil fertility rotations and pests. National Forum on Cover Crops and Soil Health, February 2014 by the USDA's SARE program. Much of the information is archived on the conference web page. North Central Region SARE 2013-2014 Cover Crops Survey Analysis results shows nearly 10 percent yield gain in corn with cover crops during drought; more than 11 percent gain in soybeans with cover crops.